When I began working on this article, Ryan Olson was absolutely dominating the Florida State League for the Daytona Tortugas. Through six starts the right hander had a 2.06 ERA in 35.0 innings with nine walks and 36 strikeouts. His last start didn’t go nearly as well, as he had his first rough start of the year. He allowed seven runs in 4.0 innings. That brought his ERA to 3.46 in 39.0 innings with 11 walks and 39 strikeouts. Still strong numbers, but not quite what they were when I started reaching out to people for some more information on Olson. The Reds selected Ryan Olson out of Cal Poly Pomona in the 13th round of the 2016 Major League Baseball draft. He had dominated in his sophomore and junior seasons, though his junior season was cut short in late march after throwing just 28.0 innings. Over his 116.2 innings pitched in those seasons he had an ERA of 1.77 with 30 walks and 118 strikeouts. Good control, outstanding numbers. But, he wasn’t viewed as big prospect coming out of college. 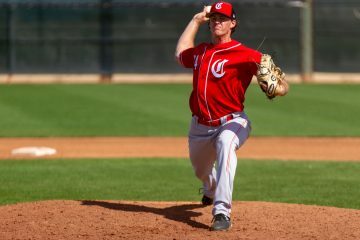 Ryan Olson didn’t pitch for the Reds after the draft. He did, however, start the 2017 season healthy. But after four starts for the Dayton Dragons he hit the disabled list with ulnar nerve irritation and didn’t return to the mound during the year. With just four games under his belt in two seasons since being drafted, Ryan Olson was nowhere near the group of players to keep an eye on entering the season. He was about as far off of the radar as a player could be who was going to be an everyday player or starting pitcher could be within the organization. Five weeks makes a big difference, though. Healthy and pitching well, Ryan Olson is looking like a legitimate prospect. He’s a bit older than your typical prospect is for the level he’s pitching at. Injuries play a part in that, of course, and age relative to level is certainly less important for pitchers than it is for hitters. Still, being 23-years-old and having success in a pitcher friendly league will understandably leave some questions about whether a player is simply beating up on younger competition or if there’s more going on than that. Ryan Olson has found some good velocity this season, throwing 93-96 MPH with sink on his fastball. He’ll mix in a slider and a curveball, as well as a change up. His change up works in the 85-88 MPH range and is the best of his secondary offerings. His control has been something that sticks out. He’s walked just 6.6% of the batters that he faced this season. And that’s come with a 23.5% strikeout rate, too – giving him an outstanding strikeout-to-walk ratio of 3.55 on the year. With four pitches, and two of them being above-average ones, there’s a chance that despite his age, he could profile as a future starting pitcher. 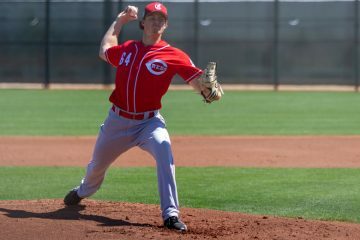 Toss in that he’s got strong control that projects well, and the Cincinnati Reds may have a real prospect that’s essentially come out of nowhere in the 2018 season. 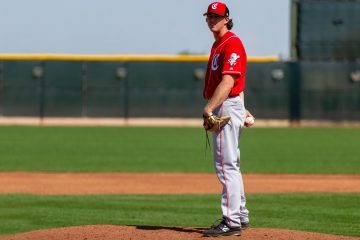 This article came out earlier this week on Patreon.com/RedsMinorLeagues for those who support the website. You can get early access to articles like this, and daily emails with notes and details on all of the games the night before by signing up for a few bucks a month of support. Is he old for that level or right around average at 23? For a guy that should be considered a “real prospect”, 21 is the age, or younger, that you want to be at if you are in Advanced-A. Great article on Olson. Time to do an article on Luis Gonzalez too? He was the Midwest League Pitcher of the Week in 2017 the first week of the season. He signed for 250k according to MLB pipeline. That 2016 draft has huge frontline potential with Senzel and Trammel. Also could be a deep one with Olson, Scott Moss, and Ryan Hendrix showing some degree of promise. Nick Hanson and Tyler Mondile are still young enough to figure it out as well.